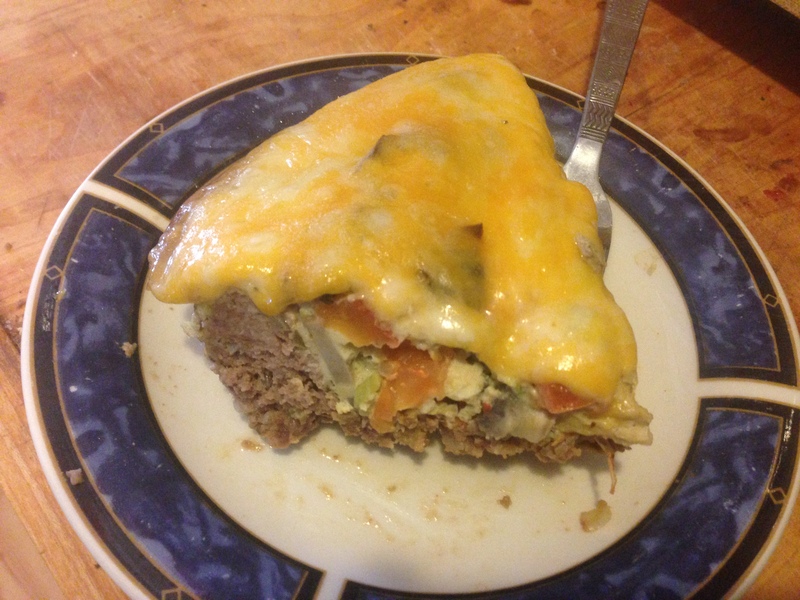 This savory pie has a meat crust, using a modified meatball recipe, pressed into a deep dish, filled with Roma tomatoes, mushrooms, and eggs and topped with melted cheese. I normally make it for dinner, but it would be great for breakfast, brunch, lunch, dinner, or any kind of meal I’ve left out. It would even work for elevenses. 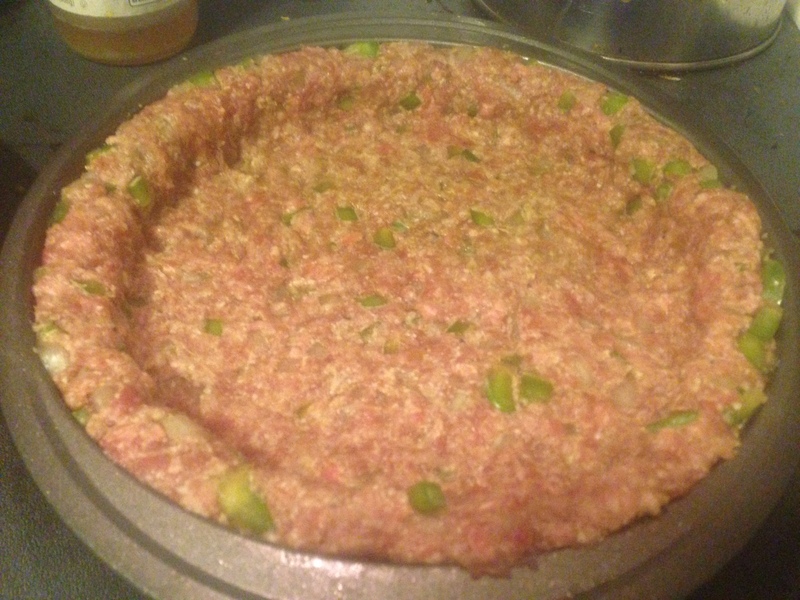 To make the crust, combine the ground beef with the rest of the crust ingredients in a bowl and mix everything together well. The best way is to just squish everything together with your fingers. The smaller you dice the onion and bell pepper, the easier it will be to get everything to hold together. In either a 9″ cake pan or a deep dish pie pan, press the mixture onto the bottom and sides to form a crust. I make the sides thicker than I would for a traditional flour crust so that it will hold up after you cook and slice it. 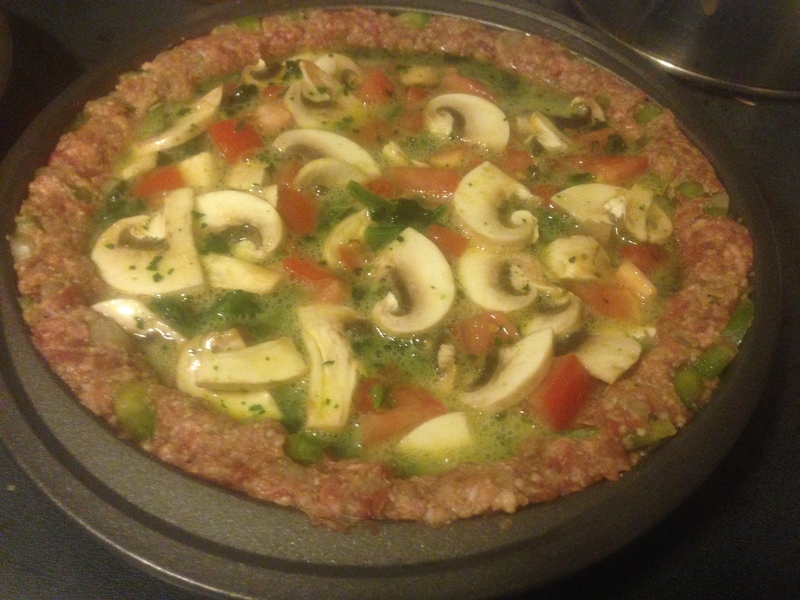 Dice the tomatoes, halve and then slice the mushrooms, and slice the green onions, mix them evenly, and place them in the crust. Crack all the eggs into a bowl, add the salt, pepper, and garlic powder, and whisk everything together until it’s evenly mixed. Pour the egg mixture evenly over the vegetables. 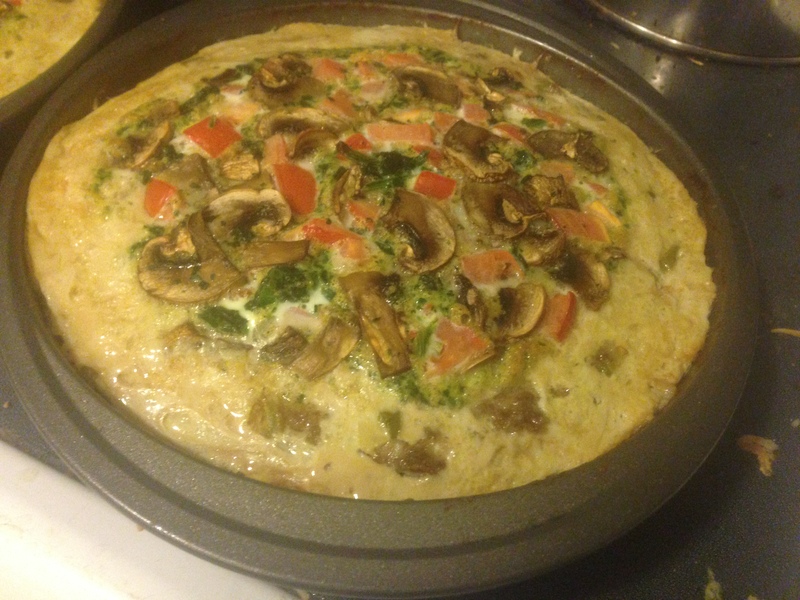 This picture actually shows some spinach with the tomatoes and mushrooms. It was an experiment, one which you’re welcome to try, but I don’t recommend it. It turned out to be overpowering. The eggs may not look like they’re covering enough of the vegetables. If you’re tempted to add another egg, your pie will probably overflow. I know this because I’ve done it more than once. I recommend sticking with 4 eggs and trusting that things will expand and settle into the desired configuration. Bake at 350º for 50 minutes. Cover the pie with shredded cheese, which ever kind is your favorite, and bake for an additional 10 minutes. Let the pie rest for a few minutes before slicing.